A do-it-yourself move can certainly earn you some money, but is the hassle worth it? There is no reason not to fill up your personal vehicle with everything you can fit. Be sure to weigh your car empty, then weigh it full to get full credit for your weight. 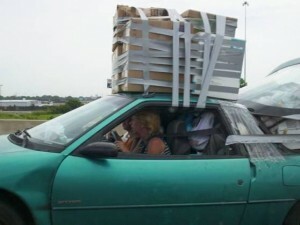 A full car moved about 500 miles will probably earn you $300. Are your new coworkers willing to help you unload everything? It’s a bad first impression to show up at your new base expecting your coworkers to move your household goods. They’ll probably help, but will know that you simply want to make some money on the move. I helped a new Airman unload her household goods into storage while she looked for a home. Five days later, she asked everybody to help her move everything out of storage and into her new home. We helped her, but our shop was very frustrated that she chose to move herself without a full plan in place. In summary, a full DITY move is only recommended if you have housing lined up at your next base, and already know friends or family that can help you unpack. What’s your opinion on DITY moves? Have you ever done a full DITY move?